Well yes, I can…but I’d rather not. To me, corrective fitting for a horse should only be used when, due to some kind of traumatic injury, the horse can never be exercised back into balance. It is in every rider’s best interest to ride and exercise their horse in a way that promotes a balanced back which will extend the rideable lifetime of the horse. Along with injuries, other causes of equine asymmetry include poor horseshoeing, the rider’s body being out of balance and training habits that we may not even be aware of. I have been extremely fortunate to know and been able to learn from Donna Snyder-Smith, who is a Centered Riding Instructor and has coached some of the top 100 mile endurance riders in the nation. She has taught me that when evaluating an out of balance horse you have to get the big picture and look at the horse, rider and tack, and how they influence each other. Sometimes we forget to take in to account the feet when looking at a problem in the horse’s back. Improper horseshoeing can definitely lead to problems in the shoulder area of the back. Unequal hoof length or shoeing at an incorrect angle can cause joints to become out of alignment with each other. 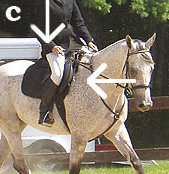 To check this, (See figure b) you can stand your horse on level ground and make sure the joints at the fetlock, knee, elbow and shoulders are even. Riders develop some asymmetry as they grow up. People are right handed or left handed or prefer to kick a ball with one or the other leg developing some parts of the body more than others. Sometimes our job influences our balance also. I drove a truck for twelve years when I was younger. My right leg worked the gas and power brakes while my left worked many times harder pushing on a heavy duty clutch hundreds of times a day. Even today, many years later, it is way easier for me to post on one diagonal than the other. Whenever we as riders are unbalanced, it causes the horse to compensate and then he can develop imbalance. Even a perfectly fit saddle is only a tool. It was developed to spread out the rider’s weight over the length of the horse’s ribcage. It does its job best when we are centered and balanced front to back and side to side. 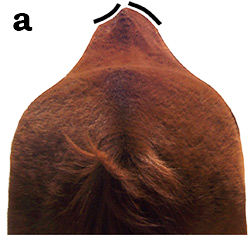 Like humans, horses develop some asymmetry as they grow up. Just as people are right handed or left handed, our horses will also develop preferences all on their own while growing up. This will show up in training when a horse has an easier time performing maneuvers in one direction but struggles to some extent in the opposite one. That’s why it’s important if you post a lot to spend an equal amount of time on each diagonal, especially if you are doing distance events like Competitive Trail or Endurance riding. Another consideration is at the lope or canter. It’s important to be able to have our horses pick up the right and left lead on command. I can hear all the groaning “But I’m just a trail rider. Why should I bother?” Just like at the trot, we need our horses to spend an equal amount of time on each lead for a nice balanced body. Especially on long straight trails, a horse will pick up the lead that is most comfortable and easy for them. We need to make sure we have them also develop the other lead. On the trail, you can test your horse’s preferences by seeing which diagonal he would rather have you post on and which leads he picks up when the choice is left up to him. Begin posting at the trot and watch for when his shoulder is coming back and your seat is returning to the saddle. (See figure c) Post that way for twenty strides and then remain seated for half a beat and switch to the other diagonal for twenty strides. Some horses that are really used to one over the other will have an instant reaction and they will fight you to get you to switch back to the other one. You can also ask your horse to lope or canter from the trot and see which lead he picks up. The lope or canter is a three beat gait. One of the hind legs lands first. Then the other hind leg lands at the same time as the opposite front leg and finally the other front leg. The last leg to land in the front determines the lead. Do this ten times and see how many times he picks up the same lead. You might be surprised. Ideally, we want to get our horses equally comfortable on either diagonal or lead because we this will extend the rideable lifetime of our horse. A balanced horse is a happy horse!